With its powerful processor, up-to 46-page-per-minute* output, enhanced security and standard Wi-Fi, the B2546dw supports the success of mid-size workgroups in all their mono printing. Get mono printing at up to 46 pages per minute*, plus standard two-sided printing, at an affordable price. Durability and long-life components keep your maintenance costs low, too. Robust and reliable, Lexmark printers are built to work anywhere from showroom to warehouse with few interventions. Keep going with long-life components, replacement cartridge yields up to 10,000 pages** and a maximum input capacity of 2000 pages. USB and gigabit Ethernet connections are just the start. Standard Wi-Fi means convenient and secure connectivity while the Lexmark Mobile Assistant app allows fast and easy setup directly from your mobile device. *Print and copy speeds measured in accordance with ISO/IEC 24734 and ISO/IEC 24735 respectively (ESAT). 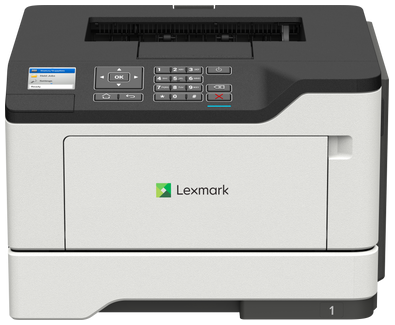 For more information, see: www.lexmark.com/ISOspeeds. **Average standard page yield value declared in accordance with ISO/IEC 19752. ***Award based on North America and/or Western Europe data ****Actual Yield may vary based on other factors such as device speed, paper size and feed orientation, toner coverage, tray source, percentage of black-only printing and average print job complexity.